This book presents the first comprehensive description of Tafi , one of the fourteen Ghana - Togo Mountain ( GTM ) languages , spoken by approximately 4,400 people in the southeastern part of Ghana . The description consists of thirteen chapters and is based on a corpus gathered during two fieldwork periods totalling fifteen months in the Tafi area . This work contains analyses of the phonology , morphology , and syntax of the language . Aspects of pragmatics , including utterance particles , conversational routines , interjections , and ideophones are described . The language has a nine - vowel system with a robust root controlled Advanced Tongue Root ( ATR ) harmony and a complex tonology . The noun class system and its agreement systems display change in progress . This study also accounts for several distinctive features of the language such as a small class of underived adjectives and a set of derived adjectives by verb reduplication ; two adpositional classes and their grammaticalization histories , and a rare split possessor system where singular kin possessors are marked differently from other possessors ( including plural kin ) . The form , function and meaning of several grammatical constructions are also covered : serial verb constructions with features marked on the first verb , split predicate constructions for some modal and aspectual meanings and a medio - passive construction for predicating properties of undergoers as well as topic and focus constructions . The influence of Ewe , the dominant lingua franca , on the structures in Tafi is noted and the distinctions between Tafi and its closest neighbour Nyagbo are highlighted . A selection of glossed and translated texts from the database representing narrative folktales , proverbs , riddles and procedural genres is also included . 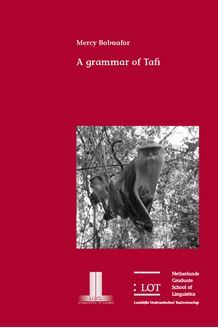 A grammar of Tafi is of interest to specialists in African linguistics , linguistic typology as well as contact linguistics . It contains valuable information for comparative studies on the Ghana - Togo Mountain languages , Kwa languages and ultimately on Niger - Congo languages .